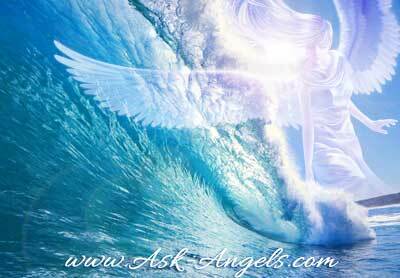 Let Your Angels Refresh & Renew Your Energy! You are guided and supported now in washing away negative influences from your life and in renewing your energy with help from the Angelic Realm. You have an active role to play in creating your future experiences, but you’re not alone! Right now is a powerful time to energetically materialize positive new beginnings and to manifest your heart’s calling… And your angels are here to help! These two new angel meditations will assist you in stepping into the light and riding the wave of Divine Love and possibility before you. Connect with the rejuvenating and refreshing energy of the Angelic Realm and with the power of Divine Love which will uplift and empower you to infuse your consciousness with the light of infinite possibility available to you through now through Love. When you click through the ‘Order Now!' button below and complete your transaction, you will receive instant access to both meditations! Both messages are set to the meditative music of Thaddeus. The Rejuvenation Meditation with Muriel also has the gentle sounds of Ocean waves from the Nature Music album by Gaia. Yes thank you for my spiritual empowerment of my energy of light . To be uplifted by calmness and to be to take in air . To stay in love and be with my lord to love. The massage is powerful and encouraging. Thank you so much for this wonderful, enlightening experience you’ve shared. Many Thanx & Blessings Melanie & Uriel, this was one of the 1st messages I clicked on, what a wonderful way to start a New Day…this is Weds. the 24th-in the I Ching this number is referred to as “The Turning Point” I look forward to a new vibration-free from the density of the past 28 yrs. of misfortune. I have always believed in God and his angels. I know only the few I was taught in Catholic school. I have always tried to help others in belief. I always find new people to help. I did not get the opportunity to become a pyschologist but I used my gift in a different way. Some ignorint people have called me a witch or a devil. I believe Lucifer exists, not satan. I believe he is still a fallen angel sent to a dark place out of God’s light and into the dark called hell. I believe in purgatory. I call it the wating room. The room where God gives you the opportunity to talk to him about your sins. He then decides to send you up to heaven to see and hear him or to hell. The dead can speak. My mother passed away in 2013. She speaks to me in dreams. She sends me signs no one else in my family receives. These signs occur everyday. I have always believed in the afterlife. Some of my family memembers do not believe in God or the afterlife. I pray for them and others like them. I have been through difficult times in my life. I mentally broke in 1973, 2007 and 2009. Doctors say I had such a high level of stress that I lost all of reality. Some doctors believe I am bipolar. I do not. I believe it is God’s way of trusting my faith in him. I did not turn from God when my mother passed, I became closer to him. I asked him to take her because she was no longer able to speak, eat or move. I asked him to end her suffering, and he did. I have had strange things happen, no one has been able to answer since I was a baby in Naples, Italy where I was born. Some people say they wish they were like me, I say no, you don’t. I ask God why he made me so different than my siblings. Why can’t I be normal. Maybe you can answer me. Am so much blessed by this holy meditation and I need it everyday of my life. Thank You so much Melanie. Blessings!!! Really get some awesome positivte,Angelic spiritual energy,sweet vibrations,for real-Sweet,THX>! Thank You so much. May we all be blessed by our Angels and Guides. Hi Melanie. What an awesome soothing video! I felt refreshed & loved/ I have so much stress & I will continue to listen..every time I am feeling this way. I’m looking forward to listen to her meditations every nite.